This past Labor Day Weekend my sister Tiffany, her husband Shaun, my niece Allie, their dog Sadie and I went to Taylor Park where we have a year round camp site. It was the first time we’ve gone without my grandma, which was a little different. My grandparents have had this spot for about twenty years now, and it is home to a lot of traditions and great memories. We wish Grandma could have been there this weekend, but she had just gotten out of the hospital after having back surgery, so it wasn’t advisable for her to do all that travelling and walking around on uneven surfaces and all that. By the way, she’s home now and doing really well. We have to remind her to take it easy, ’cause the pain is more/less gone and she feels great. It’s awesome to see that it worked so well. If you were among those praying for her, thank you very much. So, the weekend consisted of a little bit of relaxing reading, playing at the playground with Allie, dodging Sadie’s leash, picking up fallen chairs that Sadie’s leash knocked over, unwinding Sadie after she wrapped her leash around various objects, swimming in the river, making meals on the new BBQ, playing nerts while Allie was sleeping, picking blackberries, and doing some cleaning and maintenance on the camp site. The biggest piece of maintenance we did was rebuilding the fire pit that Grandma and Grandpa carefully constructed from flat stones they gathered from the banks of the river. Over the years it had gotten pretty messed up as rocks broke due to the heat, and got displaced just because people were always walking on them. So, Shaun dug out the center of the pit and he and I pulled out all the existing rocks and re-set them, discarding the broken ones and trying to set the good ones as firmly as we could with the powdery dirt we had to work with. We ended up going to Lowe’s in Salem and getting some 2″ high rectangular concrete pavers that we intended to use for the bottom of the pit (which we did, but then covered up with rocks and dirt to maintain the same classic look). We also used some of those pavers to replace the existing ones that made a step from the ground up to the patio. We think it all looks nice and not much different than what it probably looked like when Grandma and Grandpa first built it–which was the goal. Tradition! 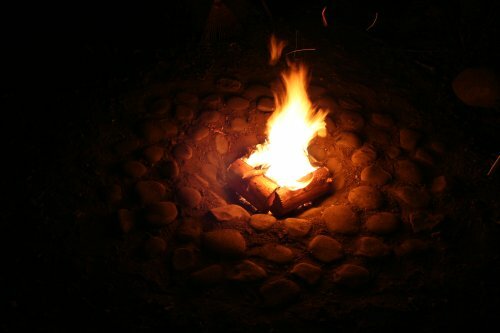 I really like what you did with the fire pit image. I’m assuming that’s not natural straight from the camera. It fades out so perfectly into your black background that I’d guess you did a little mask work or airbrushing. Nice effect! It also has a somewhat painterly look to it, like those cool cartoony Mexican paintings in the former Bajio restaurant. Thanks for the compliments, but the only thing I did to the image was resize it and compress it. I also really like how it blends into the background… My photo teacher would say all that black is lost information and not the best it could have been, but I like it. It’s more artistic than a photo that was exposed in such a way that the whole area was visible in detail. I really like the fire pit. It makes me happy that you kept it looking like it used to. That photo does look like a painting – very artistic. Glad to hear Grandma’s doing well too. Tell her we love her. glad everyone likes it! I think I’ll steal your pic of it for my blog, cause the one I took with my camera doesn’t look this nice, lol.